The Boston Red Sox have 10 players in the Hall of Fame, nearly half of whom were outfielders: Harry Hooper, Ted Williams, Carl Yastrzemski, and Jim Rice. When a team has immortals of that caliber, you would expect it to build the other seven defensive positions around them. But the Red Sox have gone far beyond that. For decades at a time, they have treated outfield positions like they were written in Sharpie. Sometimes, that was because Ted Williams was flanked by excellent players like Dom DiMaggio and Jackie Jensen; sometimes their consistency may have been dictated by convenience more than strategy. For much of the 20th century, the Red Sox had at least two outfield spots set in stone and only a single position to figure out. For much of the 1940s, it was Williams and DiMaggio in left and center. In the 1950s, DiMaggio gave way to Jensen, and in the 1960s, Williams gave way to Yastrzemski and Tony Conigliaro, and eventually Reggie Smith. In the 1970s, after Conigliaro’s tragic eye injury and Smith’s departure, the positions were ably manned by Rice, alongside Fred Lynn and Dewey Evans. When it came to the outfield, especially left field — the home of Williams, Yaz, and Rice (and eventually Manny Ramirez and Andrew Benintendi)— the Red Sox had a clear mandate: don’t rock the boat. That made them the polar opposites of the Seattle Mariners, who have had virtually no consistency in left field in their four decades of existence. Since 2013, I have written several pieces evaluating the way a particular team has filled a particular position over the past several decades. You can see them in the sidebar below. While front offices, managers, and field personnel change, and the game itself changes, I find these deep dives fascinating, and hope that you do as well. From 1940 to 1951 (excluding the war years 1943-1945), Williams and DiMaggio had left field and center field on lock, so Red Sox managers just had to figure out who would patrol near Pesky’s pole. Williams had a much longer career than DiMaggio, playing from 1939 to 1960, so I extended this study to examine a few of the seasons before and after him, to look at three decades of Boston outfields. When you look at Red Sox outfields of the midcentury period, one thing becomes very clear: nature abhors a vacuum, and the Red Sox hated uncertainty in the outfield. The defining Red Sox outfielder in the years before Williams was a man named Tom Oliver. A banjo-hitting center fielder, he played four seasons in the major leagues from 1930-1933, and he started in all but 28 of his career games, all with the Red Sox. Another way of saying that is that the other 15 teams didn’t see him as a major leaguer, but the Red Sox saw him as a starter. My analysis really begins in 1935, when the Red Sox got four Wins Above Replacement from their outfielders, nearly half of that total from Roy Johnson, who had been even better in 1933 and 1934 but was coming to the end of his career. Most of the rest was from Dusty Cooke, who had been great in 1933 and would be reasonably effective again in 1936. Doc Cramer was the regular center fielder from 1936-1940, making the All-Star team every year from 1937-1940 even though modern metrics view him as an unimpressive contact hitter with a powerless bat and an undistinguished glove. Ben Chapman manned right field in 1937 and 1938. Though contemporary fans may know him better as the racist manager who Alan Tudyk played in the movie 42, in his playing days Chapman could thump the ball, contributing more than six WAR in those two years even though he arrived only after the Senators dealt him to the Sox in June 1937. Meanwhile, Joe Vosmik took over left field in 1938 and 1939, and though he was quite good in 1938, his bat vanished in 1939, and the Sox sold him that offseason. In 1939, of course, the future of the franchise changed forever, because the Red Sox called up a baby-faced 20-year-old named Theodore Samuel Williams. It’s frankly astonishing they waited that long; in 1938, Williams hit like a prewar Vlad Jr., winning the American Association Triple Crown by hitting .366 with 43 homers and 142 RBI. Williams started nearly every game of the season in right field in 1939, and he had one of the best years any 20-year-old has ever had: .327/.436/.609, with 31 homers and 145 RBI. Still, that was only good enough for fourth place in the MVP vote, behind Joe DiMaggio, Jimmie Foxx, and Bob Feller. He finished second behind Joe DiMaggio in 1941, too. Then he went to war. Joe was the middle brother of three major leaguers in the DiMaggio family, and his two brothers were also fine ballplayers. Older brother Vince played his full career in the National League and was ahead of his time as a Three True Outcomes player: he led his league in strikeouts during six of his eight full seasons, but he also hit double-digit homers in each of those years and had a walk rate near 10 percent. They were three very different players. Vince hit homers and struck out; Joe hit homers but didn’t strike out; and youngest brother Dom didn’t homer or strike out much. But he played a beautiful center field, walked even more frequently than either of his brothers, and was nearly as much a fixture in Boston as his famous brother in the Bronx. Dom DiMaggio came up to Boston in 1940, and he easily took center from Doc Cramer, which meant that center and left field were set. So, from 1940-1942, the main right fielders were Lou Finney and Pete Fox, veterans who, like Cramer, had little in their bat beyond an empty average. But two of the three positions were firmly in hand. In 1943, DiMaggio and Williams were drafted. Finney would have been, but his SABR biographer explains that he went back to his Alabama farm to avoid it. Pete Fox was too old to be drafted, so he became the team’s primary right fielder. The primary center fielders were Leon Culberson (Charlie Culberson’s grandfather) and George “Catfish” Metkovich. They were okay enough, all things considered, as was Fox; over those three war years, the trio was good for roughly three wins each, about one win per player per year, good enough for a platoon partner. Then the war ended, and the Sox got their outfielders back, so they didn’t need him any more, and 1945 proved to have been Johnson’s last year in the majors. He debuted at age 27; had he been brought up from the Pacific Coast League sooner, or played for better teams than the awful Philadelphia Athletics to which he gave his prime, he might have been a Hall of Famer. Ted and Dom were back in 1946, and the team was loaded for bear. Right field had a rotating cast of Culberson, Metkovich, and a past-his-prime Wally Moses, but it really didn’t matter who they ran out there, especially with the Sox’s infield of Rudy York, Bobby Doerr, and Johnny Pesky at first, second, and short. The Sox had their best team in years, and they rode it all the way to a pennant — their first World Series appearance since Babe Ruth and Harry Hooper led the 1918 team to victory. But the success was to be short-lived. It was the only postseason appearance of Williams’ career, as the Sox lost to the Cardinals, led by the bat and legs of Enos Slaughter, whose Game Seven “Mad Dash” proved decisive. (Slaughter scored the go-ahead run from first base, thanks to a weak throw from Culberson.) The Sox would not make it back to the World Series until 1967, when they would once again lose to the Cardinals in seven games. The new face in right in 1947 was Sam Mele, joining Culberson and Moses. Mele was okay in 1947, but he slumped all year in 1948, and was traded away in 1949. The Red Sox also traded Culberson to the Senators to reacquire Stan Spence, a player who had been terrible in Boston at the start of his career in 1940 and 1941, blossoming only after the Sox traded him to Washington in the winter of 1941. After he averaged four wins a year in the nation’s capital, Boston wanted Spence back — but upon his arrival, he turned right back into who he was when the Sox had him before, undistinguished with the bat or glove. So in 1949, the Sox traded Spence to the Browns for Al Zarilla, who had been an All-Star the year before. He didn’t do much for them for the rest of the year, but in 1950, he turned in a virtual repeat of his All-Star campaign, contributing three wins in right. Williams broke his arm during the All-Star Game, so he was mainly supplemented in left by Billy Goodman, a super-sub who finished second in the MVP voting by leading the majors with a .354 batting average while playing five positions. Then they traded Zarilla for two pitchers, and it was back to the drawing board. Dom and Ted were in place in 1951, and Goodman again played some corner outfield, with most of the right field innings going to a journeyman named Clyde Vollmer. Neither was terrible. But Williams would be away once again in 1952, called up from the Marine Corps Reserves to serve as John Glenn‘s wingman in the Korean War, and the team had to scramble to fill two positions. This time, Vollmer was backed by Hoot Evers and Faye Throneberry (brother of Marvelous Marv). But neither was much more than a replacement player, and DiMaggio was getting older — it would be his last year. The outfield was looking like a mess. After the Korean war ended in 1953, Williams played his way back into shape, but he wouldn’t return until the last two months of the season. So, heading into the year, for the first time since 1943, the Red Sox needed to figure out their plan for three outfield positions simultaneously. One answer was already on the team: Jimmy Piersall, whose battle with bipolar disorder was dramatized in the film Fear Strikes Out. He’d played a handful of games in right in 1952, and won the job outright in 1953. The main left fielder in 1953 was again Evers, supplemented by Gene Stephens, and the center fielder in 1953 was Tom Umphlett. But Umphlett couldn’t hit or field, and in 1953, neither could Piersall. The following year, 1954, all was easier: Williams was back, an improved Piersall was the regular right fielder again, and the main center fielder was the terrific Jackie Jensen. Then in 1955, Piersall and Jensen swapped jobs, holding down center and right alongside Williams in left. That pretty much fixed the starting outfield for 1956, 1957, and 1958. Across those years, the supporting crew included old hands like Stephens, Throneberry, and Mele. (They got Mele back off waivers in 1954, and sold him away again in 1955.) Those guys weren’t particularly good, but it didn’t particularly matter. In 1959, Piersall was gone, traded to Cleveland for aging slugger Vic Wertz. But Jensen was still in right and the 39-year-old Williams was still in left, so the only revolving door was in center field. It was mainly handled by Gary Geiger and Marty Keough, along with Stephens. It was also the worst year of Williams’ career, indeed the only bad year he ever had, as he posted a BABIP fully 82 points below his standard and his bat was unable to offset the poor defense from his stiffening legs. In 1960, his swan song, Williams’s bat came nearer to vintage quality, but the team struggled to deal with Jensen’s early retirement, which partly owed to his terrible fear of flying. Keough was back in the outfield, as were Geiger and Stephens, and even an aging Bobby Thomson, the Flying Scot, who once hit the Shot Heard ‘Round the World but was now himself in the last year of his career. Though Geiger hit a bit, none but Williams really distinguished himself. At year’s end, after more than two decades in the uniform, Williams hung up his cleats. Going into 1961, Boston made its best effort to replace an irreplaceable player, plugging in a 21-year-old rookie who would actually spend more time in Boston than even Williams had: Carl Yastrzemski. But the rookie couldn’t do much that year, nor could a briefly un-retired Jensen, as Geiger was the most productive outfielder on the team. The backup in center and right was Carroll Hardy, a role he would play from 1960-1962. In 1962, though, Yaz became Yaz, hitting for average and power and playing nearly every game, as he would do for pretty much the next 20 years. Opposite him were Geiger, Hardy, and a guy named Lou Clinton, who handled most of the reps in center and right in both 1962 and 1963. 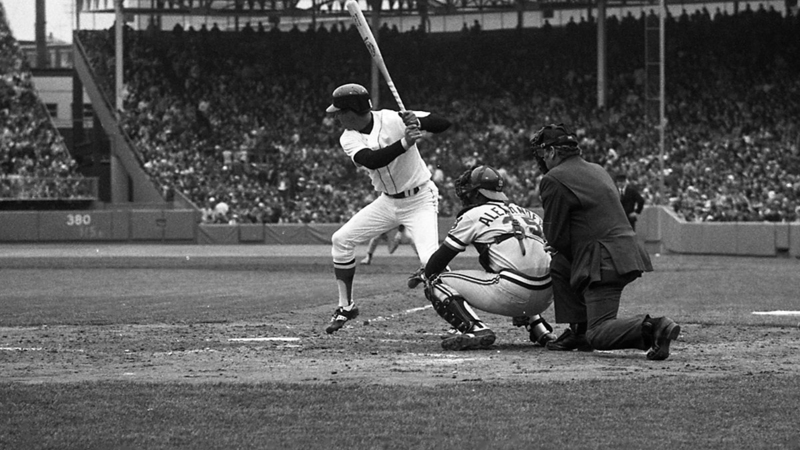 Then, in 1964, the Sox debuted a new phenom, 19-year-old Tony Conigliaro. In his rookie year, Tony C and Yaz both played a bit of left and center, but after that, Conigliaro established a regular home in right field. The same would be true in 1965, where the new faces in center were the decent enough Lenny Green and Jim Gosger. As usual, the following year they would turn to someone else for center, with two of their outfield slots clearly set. If it hadn’t been for a tragic injury in 1967, getting struck in the eye by a pitch, Conigliaro might have been the next decades-long Red Sox outfield fixture. But more mainstays would come. In 1967, Reggie Smith finished second in the Rookie of the Year vote; he started in Boston until 1973. Then Dewey Evans debuted in 1972, and Jim Rice and Fred Lynn came along in 1974. Yaz spent some time at first, and Evans, Rice, and Lynn were the main outfielders for the rest of the decade. Guys like that will make any lineup card easier to fill out. If you have immortals, play them! If you don’t, sometimes it makes sense to go with the devil you know — whether it’s Cramer or Fox, Metkovich or Culberson, Stephens or Throneberry, Geiger or Hardy. The essence of decision-making is reducing needless complexity without losing sight of what matters. The Red Sox made many mistakes over the period I analyzed here, of course. Perhaps the single greatest reason that the Sox failed to finish first at any time between 1947 and 1966 is that they were the last team in baseball to integrate; nowadays, the Red Sox of the 1950s are remembered as much for virulent racism as they are for the Splendid Splinter. But it is difficult to argue with the team’s overall success in staffing the outfield, with an impressive array of regulars from Hall of Famers like Williams and Yastrzemski to All-Stars like DiMaggio, Jensen, Piersall, and Conigliaro. It was really a remarkable run, and it lasted for decades after Williams’s retirement, thanks to Yaz and Smith and Evans and Rice and Lynn. In fact, the outlook for the next few years looks remarkably similar, with Andrew Benintendi finishing second in the 2017 Rookie of the Year vote, and playing next to Mookie Betts, the man who won the MVP in 2018 at the tender age of 25. Given what he’s accomplished already, there’s no telling what he could do over the next 15 years. If he keeps it up, he might just be their best outfielder since a certain tall left-handed hitter retired in 1960. That isn’t every player who played an inning in the outfield in Boston; it’s just the players who played significant innings in at least one season. As in my Mariners case study, I generally defined that as at least 10 starts in a year in which no one started 100 games in left, or at least 20 starts in a year in which one player started at least 100 games in left. Picture heading says his first full season was 1962, but it was 1961 (thought you’d want to fix it, since it’s the first thing someone reads). Good article! His first full season was 1961, but it was in 1962 that Yaz had an .832 OPS. It was .721 in 1961. Yes, you’re right, and I had that correctly described in the text. The caption was written by brain sneeze. TW finished second to another Joe in 1942. Joe Gordon was first and Ted second that year even though Ted won the triple crown, as well as leading all baseball in runs, OBP, Slugging, and OPS. I will fix the MVP comment in 1942, but I think your draft comment is a bit of a technicality — paraphrasing the below MLB.com story, Williams was given 1A draft status in 1941, received a deferment, was heavily criticized by fans, and then he volunteered for the Reserves. So I don’t think it’s quite true to say he wasn’t drafted, but I appreciate the clarification! There was a big difference in getting drafted or joining the reserves. If Ted just got drafted he never would have been called up the second time for Korea. Still this was a really good story. Thanks for writing it. It was still really unusual that he was called up the second time for Korea.